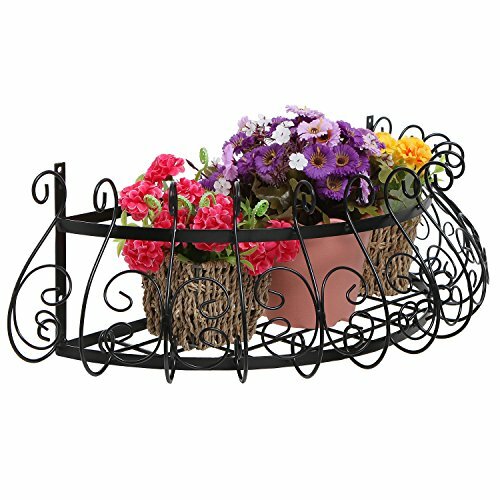 This scrollwork metal basket rack is sure to add a touch of elegance to any home design. The half-circle shaped interior is ideal for storing and displaying a variety of items, from candles and potted plants to folded hand towels and spice jars, and the beautiful scrollwork railing helps keep the items from falling. Whether you use it to hold fruit in the kitchen or toiletries in the bathroom, this black metal basket shelf does it all in a glamorous and elegant way. Approximate Dimensions (in inches): 23.5 W X 7 H X 10.25 D.
A wall-mounted metal storage basket featuring a black finish and an elegant scrollwork design. Perfect for adding storage and display space to any room in your home.